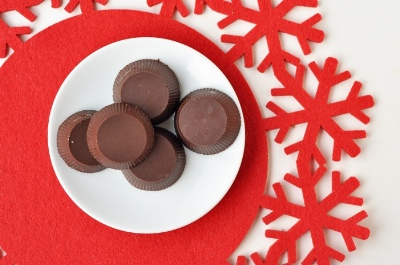 Our new covered nuts are party pleasers and great for sharing over the holiday season. With 13 flavours including hot chill peanuts, roasted peppercorn almonds and caramelised honey cashews, it won’t be hard to find a favourite! The festive season can be a tricky time if you can’t have certain foods. Our recipe ebook is packed with easy gluten free, dairy free, soy free and vegan recipes and most are low carb and paleo too. Click here to download for FREE! 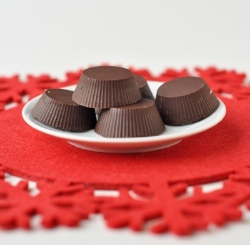 -Melt our chocolate drops with our coconut oil until runny and pour in a few millimetres to cover the bottom of 6 mini muffin cup (silicone cups work best for this as it is easiest to pop the cups out afterwards). -Allow the chocolate layer to set for a few minutes in the fridge, then drop half a teaspoon of our hazelnut butter into the centre- note, scoop a little lower in the cup to get the thicker and less liquidy butter as it will stay put in the centre better! -Top the cups up with the remaining chocolate to cover the hazelnut butter, add a touch of sea salt on top if desired. -Allow to set fully before popping out of the cups.